What a day we had. 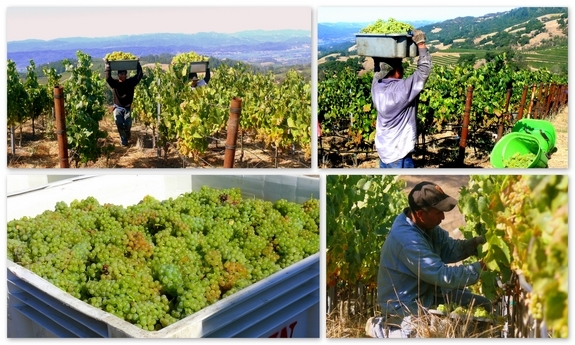 It was harvest at one of Kendall-Jackson’s Alexander Valley, hilltop, Chardonnay vineyards. We were there, watching the grapes come in and witnessing the amount of energy needed to bring in the sweetheart of all agricultural crops (grapes). 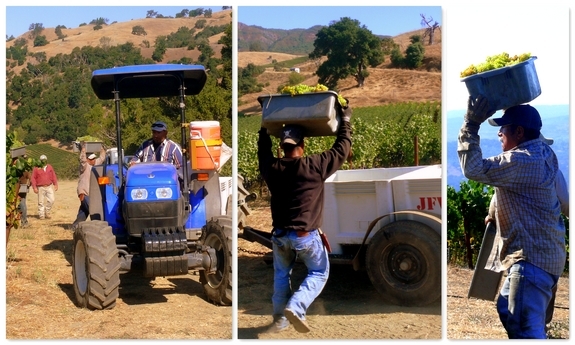 Witnessing the guys pick the fruit and running up the hills to deliver the grapes to the bins is something to see…at least once, if you have a chance. This is where your wine begins! After leaving the harvest epicenter, we drove around viewing some of the other vineyards that encompass the Jackson Family properties. 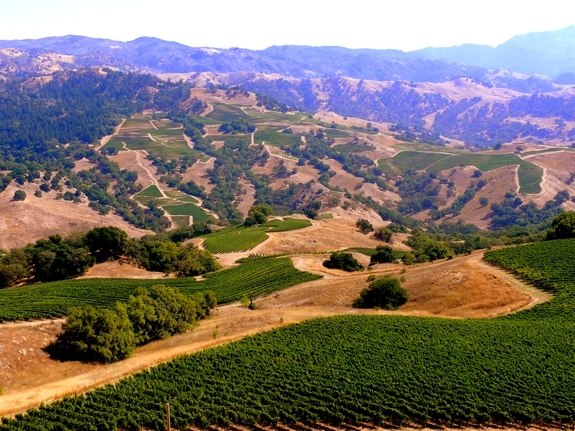 This is a partial view of a 5500 acre parcel dotted with vineyards. We talked thoroughly about the varying microclimates and soils that make up this area. All of these aspects go into making many of the unique wines Kendall-Jackson offers. 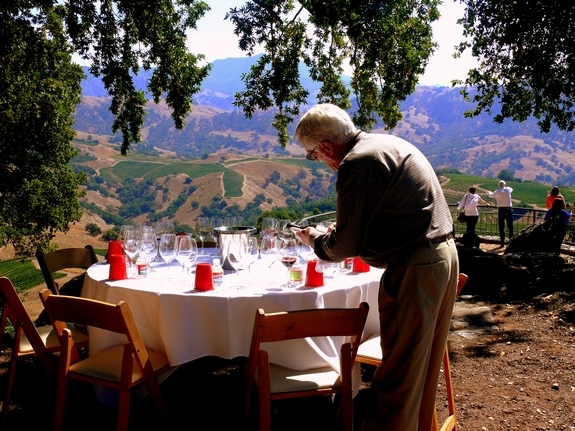 After taking it all in, we were treated to a hilltop tasting on the property (about 2400 feet in elevation). The Highland Estate wines were an elegant representation of how different aspects of climate and soil come together to make exceptional wines. The norm for this trip has been fabulous meals in beautiful locales, yesterday was no different. 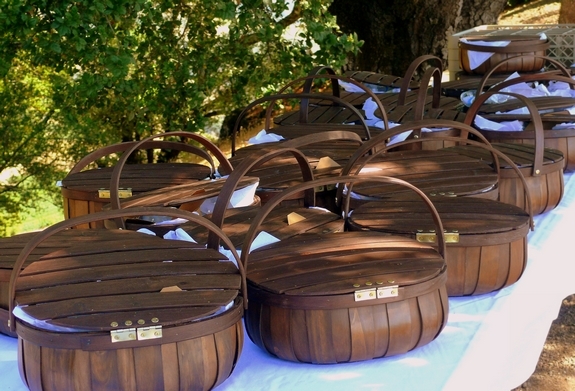 Lunch on the mountain was delivered to us in our own personal, picnic baskets. Gourmet quinoa salad, turkey and roast beef sandwiches, cookies and figs were on the menu. We of course enjoyed this lunch with an array of Stonestreet Wines. After a brief stop back at the hotel (maybe an hour), we were off again to Jackson Park Ranch where we converged under the Bay Laurel trees on another hilltop vineyard site. We spent time with Kendall-Jackson’s wine educator, Gilian Handleman and winemaker Matt Smith, and talked about how to pair wine with foods like fig, nectarine, corn and all kinds of other fruits and vegetables. Who doesn’t love to eat beets with wine? We had a blast tasting and experiencing each flavor as we paired it with Sauvignon Blanc, Chardonnay and Pinot Noir. 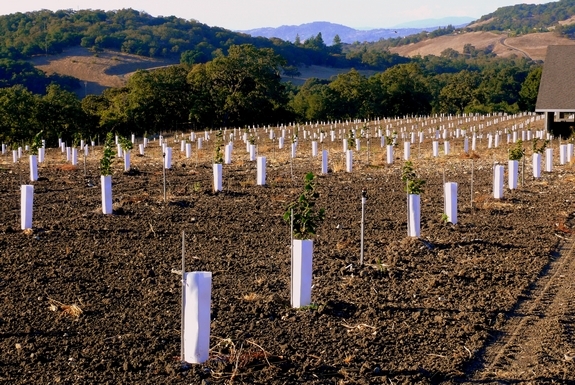 At Jackson Park Ranch we got to see first hand the pet project of vineyard manager, Brian Malone, a truffle orchard in it’s beginning stages. Can’t wait to see this in 10 years…amazing. Leaving Jackson Park Ranch we headed over to Mantanzas Creek Winery. 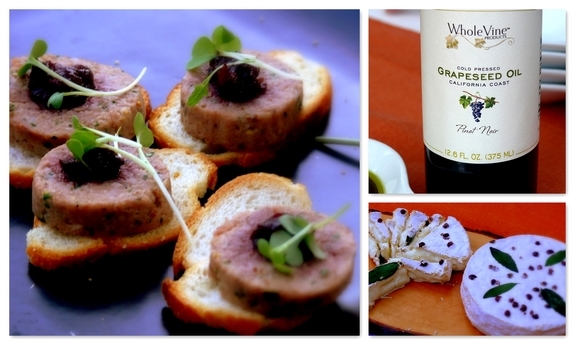 Waiting for us was a host of local Sonoma food purveyors who were serving their products at a poolside reception. Mantanzas Creek wines were served alongside Liberty Ducks, Gourmet Mushrooms, Drake’s Bay Oysters, Whole Vine, and Redwood Hill Farm Cheese. Kendall-Jackson and Mantanzas Creek wines accompanied this exquisite meal. 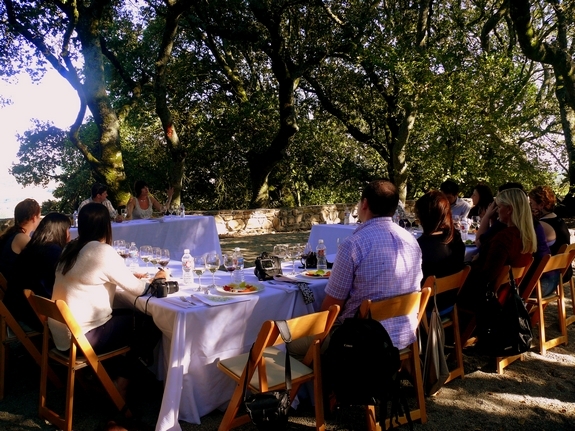 All in all, it was another amazing day of wine education and food. We were able to see first hand several of the Jackson Family Properties and understand how each winery functions independently to create unique wines that express varietal character and terroir. 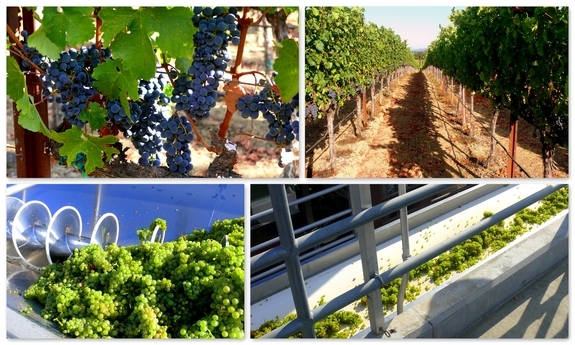 Oops, I almost forgot the crushpad and vineyard pictures from Stonestreet Winery. Years ago on one of our road trips we went up to a small store owned by KJ and came across the daughter… Very nice and friendly even invited us to a bbq.. imagine that… Their wine as well as the other wineries you mention we have had… Love the northern Ca. wines..
Wow, what a great day…so jealous! We just moved to the area and all of this is practically in our backyard; what a beautiful trip! I can’t imagine going to visit any of these places would be as wonderful as your experience with this event, but I hope to see a few of these places while we live here (even though I don’t drink wine, hopefully I’ll still fit in). Thank you for sharing! So beautiful! I never thought of grapes as being the sweetheart of all crops, but I think you are right! They are a delicious fruit that can be transformed into the sweetheart of all beverages….wine! Thanks for the pictures. Keep them coming. What a fabulous weekend! However did you come down to earth after? Wonderful pics and write up! Where can I get these baskets from?